At Tidel, we recognize that there are a number of retail franchise owners who elect to not utilize the services of third party cash-in-transit providers to transport their deposits to their bank. This could be due to that fact that their store is in very close proximity to their local bank branch, where the owner or manager doesn’t mind transporting the deposits as part of his daily activity. To the franchise owner, spending a few minutes away from the store and transporting money to the bank isn’t a significant burden. But managing cash in a store goes far beyond transporting funds to the bank and making the deposit on time. When franchise owners manage cash using older, manual methods, there are other risks and associated costs involved – including risk of theft and robberies, lack of cash visibility, spending time counting money, experiencing numerous “overs and shorts”, investigating discrepancies, preparing deposits, and managing the store’s change fund. These costs can add up quickly, which can certainly put a dent on the retail store’s bottom line. 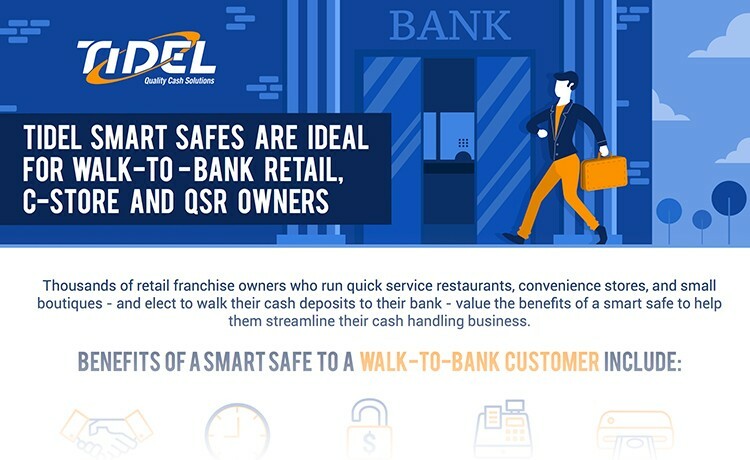 Tidel smart safes are designed to protect, automate, and streamline the cash management function for a wide spectrum of franchised stores – including quick serve restaurants, convenience stores, and others, enabling these organizations to increase efficiencies, promote accountability, reduce risks, and improve operating margins. 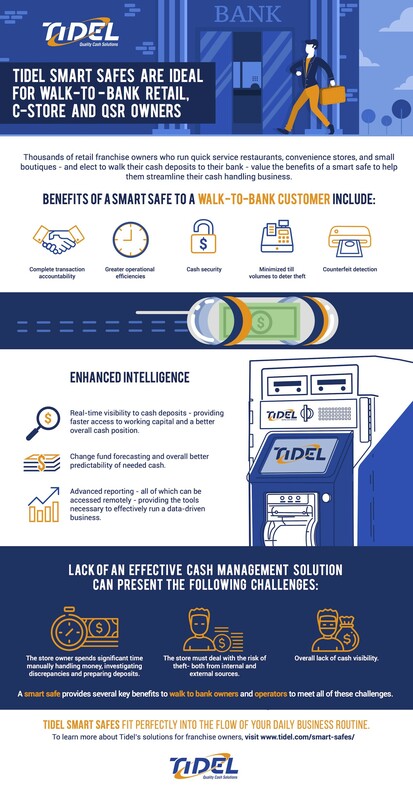 The accompanying infographic highlights how our solutions help relieve the costs and risks associated with manual cash handling – particularly for owners who remain proponents of self-transporting their deposits to their bank. To learn more about our automated cash management solutions, visit www.tidel.com today.